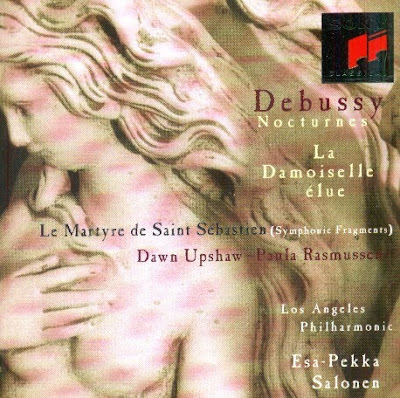 In 1884, the 22-year-old Debussy had won the Prix de Rome with his cantata L'Enfant prodigue, and among the official works which he produced during his four sponsored years, La Damoiselle élue was the most original, bringing the name of Debussy clearly to the notice of the musical public in Paris when it was performed at the Société Nationale in April 1893. Much later , in 1911, the influence of Parsifal returned - but this time closely assimilated into the real Debussy style - when at short notice he wrote incidental music for Le Martyre de Saint Sébastien. This was an extravagant five-hour theatrical production - a Mystère or miracle play, combining drama, dancing, elaborate stage effects, and music (soloists, chorus, and orchestra). The play was by the exiled Italian author Gabriele D'Annunzio; and, controversially, the Jewish dancer Ida Rubinstein took the role of the Saint - a young officer of the Praetorian guards in the third century, ordered by Diocletian to be killed by his own archers because of his sympathy for persecuted Christians. Christian and pagan images come together in vivid scenes which range from tenderness to extreme violence. In its original form it was not a success when produced in Paris in 1911; but attempts have been made to revive it in various modified forms - in particular, a version using Debussy's incidental music linked by narration has proved successful in the concert hall. 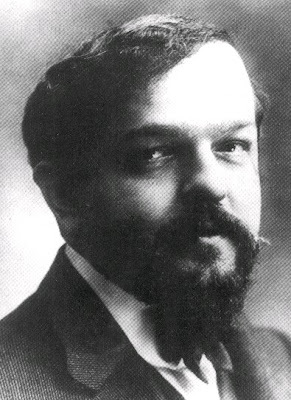 Also, with the collaboration of Debussy's friend André Caplet, a suite of four "Symphonic Fragments" was made. The first of these is from Act I, "The Court of Lilies": after a solemn liturgical-sounding prelude, the scene is set in rich and sad melodic style, for the torture and martyrdom of two young Christians. The next, also from Act I, is the "Ecstatic Dance" of Sebastian on live coals, as (after a sign from heaven) he is inspired to help the persecuted Christians - a section both fierce and sensitive, orchestrated with much colour and variety, ending with music accompanying a miracle and a heavenly vision. The third fragment is the poignant music of "The Passion" from Act IV - Sebastian's masochistic expectation of martyrdom, welcoming the arrows from his own archers. And in the final excerpt, the atmospheric music accompanies a scene among the ancient laurels of Apollo's Grove, the place of Sebastian's martyrdom, when the saint has a brief vision of "The Good Shepherd" and the sacrificial lamb. The CD was released by Sony Classical, 1994, (DDD). SK 58952.